« Do you Hear Through Your History? If I was a plumber and knew my friends, family, and neighbors had leaky faucets, I would be willing to help them. I would shake my head in bewilderment if they didn’t ask me to help. And I would be disappointed for them to have leaky faucets. Why? Because leaky faucets mean they have water to clean up or possibly water damage. 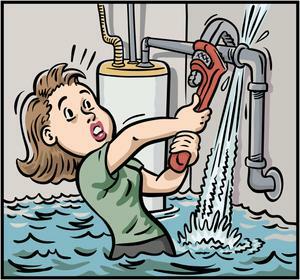 An undetected leak would also include mold growth and damage. Leaky faucets also result in a higher cost in water bills. And it means a waste of a precious resource. Symptom suppression is the same. While suppressing the symptoms, we are not resolving the problem. This means longer healing times, IF healing occurs at all. It means possible further damage caused by the side effects of the symptom suppression medications. And, it means the initial problem continues to produce the same or similar symptoms because it is not resolved. Symptoms are actually messages to the brain/body that a problem exits. The body will continue to send the messages as long as the problem exists. That means the symptoms continue or increase in intensity or duration, which means more medication is needed to suppress them. It’s an interesting and complex cycle which often becomes a cyclone of symptoms which leads to more and different medications to address or suppress the symptoms. Sadly, I shake my head in bewilderment wondering why anyone would want to continue on that path, especially when other options exist. Yet, I witness the journey for many, If I was a plumber, their continued leaky faucets would be disappointing for me to witness . As a health and life coach, their suffering is painful for me to witness. Yes… there are times I wish I was a plumber.